Kung-Fu Master is a side-scrolling beat 'em up game produced by Irem as arcade game in 1984 and distributed by Data East in North America. The game was initially released in Japan under the title of Spartan X[a] as a tie-in based on the Jackie Chan film Wheels on Meals (which was also distributed under the name Spartan X in Japan); however, the game has no bearing on the plot of the film outside the names of the main protagonist and his girlfriend, allowing Irem to export the game without the license by simply changing the title. The players control Thomas, the titular Kung-Fu Master, as he fights his way through the five levels of the Devil's Temple in order to rescue his girlfriend Sylvia from the mysterious crime boss Mr. X. Kung-Fu Master is regarded as the first beat 'em up video game. It had a NES port titled Kung Fu, which sold 3.5 million cartridges. The arcade game also inspired a 1988 French film of the same name. The player controls Thomas with a four-way joystick and two attack buttons to punch and kick. Unlike more conventional side-scrolling games, the joystick is used not only to crouch, but also to jump. Punches and kicks can be performed from a standing, crouching or jumping position. Punches award more points than kicks and do more damage, but their range is shorter. Underlings encountered by the player include Grippers, who can grab Thomas and drain his energy until shaken off; Knife Throwers, who can throw at two different heights and must be hit twice; and Tom Toms, short fighters who can either grab Thomas or somersault to strike his head when he is crouching. On even-numbered floors, the player must also deal with falling balls and pots, snakes, poisonous moths, fire-breathing dragons, and exploding confetti balls. The Devil's Temple has five floors, each ending with a different boss (described as "sons of the devil" at the start of the game). In order to complete a floor, Thomas must connect with enough strikes to completely drain the boss's energy meter; he can then climb the stairs to the next floor. Thomas has a fixed time limit to complete each floor; if time runs out or his meter is completely drained, the player loses one life and must replay the entire floor. Upon completing a floor, the player receives bonus points for remaining time and energy. The boss of the fifth floor is Mr. X, the leader of the gang that kidnapped Sylvia. Once he is defeated, Thomas rescues Sylvia and the game restarts at a higher difficulty level. 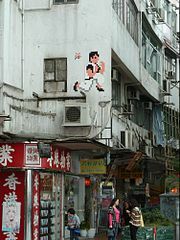 The game was originally based on Bruce Lee's 1972 movie Game of Death, with the five-level Devil's Temple reflecting that movie's setting of a five-level pagoda with a martial arts master in each level. However, the title was changed during development to make it a tie-in to Jackie Chan's Spartan X.
Kung-Fu Master was ported to the Atari 2600, Atari 7800, Amstrad CPC, Apple II, Commodore 64, NES/Famicom, MSX (Irem/ASCII version as Seiken Achō), PlayChoice-10 (arcade, nearly the same as the NES version), ZX Spectrum. The NES version was converted and published by Nintendo as Kung Fu in North America and the PAL region. It was also made for the 8-bit Gameking console, under the name of Nagual. The arcade version was later included along with the arcade versions of 10-Yard Fight and Zippy Race in IAC/Irem Arcade Classics for the PlayStation and Sega Saturn, released in Japan only in 1996 by Irem and I'Max. The arcade version was released to cell phones. The Amstrad CPC and ZX Spectrum versions of the game were included on the 1986 compilation They Sold a Million 3, along with Fighter Pilot, Ghostbusters, and Rambo. There was going to be an arcade sequel called Super Kung-Fu Master, but it was never released. Irem's 1988 Vigilante was intended as a followup. The gameplay is nearly the same, but with a completely different plot added to it that takes place in the urban areas of New York City, where a nameless titular character must save his girlfriend, Madonna ("Maria" in the Sega Master System version) who was captured by the Skinheads ("Rogues" in the Sega Master System version). One unique feature is the ability to pick up and use the battering weapon: the nunchuks, until either the player gets hurt, finishes a stage or begin battling the final boss. In 1990, the arcade game received a completely different Game Boy sequel titled as "Kung-Fu Master" ("Spartan X" in Japan), which has similar gameplay to the arcade game, but with a completely different plot and setting with the same protagonist along with a new set of enemies different stages and new bosses including a Chainsaw Man, another Strongman, a Napalm Bomber, a Ninja, a Shinobi and a mysterious and wealthy Kung Fu Master named Zapp Morgan who is the leader. Some of Thomas's new abilities are back-flip kicks and small bombs dropped by enemies. The flat levels were modified into stages with different platforms and objects in an urban city style similar to Vigilante's. The English version was modified from the Japanese version, by changing the look of Thomas, renaming him "Bruce Leap", and add some small enemies in the final stage before fighting the final boss. In 1991 a Japan-exclusive sequel to the game was released for the Famicom, titled Spartan X 2. Like Vigilante and the Game Boy version of Kung-Fu Master, Spartan X 2's plot is also quite different and takes place in an urban area, with no mention of Sylvia, but rather "Johnny Spartan", a member of an unnamed crime-fighting unit who wears a red, short-sleeved jacket, an charges with foiling 6 drug smugglers including a punk named Flamey Joe, a magician named Chin Gen Sai, a boatswain strongman named Billy Bailey, a circus trainer named Mr. Benjamin, a femme fatale named Madda Lin and the crime syndicate leader and kung fu master named Caeson Hawk. One unique feature is the ability to crouch for a second before either sending an uppercut or grab and throw enemies from behind. Spartan X 2 did not receive a North American release until 2016, when it was included as a built-in title for the Retro-Bit Generations retro video game console under the name Kung-Fu Master 2. ^ Japanese: スパルタンX, Hepburn: Suparutan X? ^ Hawken, Kieren (6 June 2017). "The A-Z of Atari ST Games: Volume 1". Andrews UK Limited. Retrieved 2 March 2018 – via Google Books. ^ Mott, Tony (5 December 2011). "1001 Video Games You Must Play Before You Die: You Must Play Before You Die". Octopus. Retrieved 2 March 2018 – via Google Books. ^ "First side-scrolling beat-em-up". Retrieved 2 March 2018. ^ "Donkey Kong - Retro Gamer". Retrieved 2 March 2018. ^ "Beat'em-Ups 101: All You Need to Know About Brawlers - RetroGaming with Racketboy". 10 August 2010. Retrieved 2 March 2018. ^ Fox, Matt (3 January 2013). "The Video Games Guide: 1,000+ Arcade, Console and Computer Games, 1962-2012, 2d ed". McFarland. Retrieved 2 March 2018 – via Google Books. ^ Leone, Matt. "The Man Who Created Street Fighter". 1UP.com. Archived from the original on July 18, 2012. Retrieved January 15, 2012. ^ "Spartan X". Arcade History. Retrieved January 22, 2016. ^ "They Sold a Million 3 - World of Spectrum". www.worldofspectrum.org. ^ "They Sold a Million 3 for Amstrad CPC (1986) - MobyGames". MobyGames. Bousiges, Alexis. 'Kung Fu Master', Arcade History, (March 2, 2005) Retrieved April 15, 2005.